December 19, 2017 – Is it candy or coal in the stockings of Canada’s premiers this December? The latest quarterly analysis of polling data from the Angus Reid Institute shows that while some provincial leaders can sleep this week before Christmas with visions of sugarplums dancing in their heads, others are feeling the pinch of a Grinchy electorate. Saskatchewan Premier Brad Wall, who announced his departure earlier this year, is back into majority approval in that province. After dropping to an all-time low of 45 per cent at the half way mark of the year, Wall has risen to a familiar place – and will leave politics as most popular premier in the country. This is a position he has held or co-held in each quarter of tracking since 2010. The only other Canadian provincial leader approaching majority approval is the newest addition to their ranks – British Columbia’s John Horgan. The BC NDP leader has had a busy quarter, announcing a referendum on electoral reform and approving the hotly debated Site C dam. Horgan, the second-most approved of relative to his provincial peers, has the sanction of 49 per cent of residents. There are several premiers who hold the approval of a nearly identical number of their constituents. Manitoba’s Brian Pallister (34%), Quebec’s Philippe Couillard (32%), and Alberta’s Rachel Notley (32%) are all approved of by one-in-three. Each was within three points of this mark last quarter as well. Ontario Premier Kathleen Wynne remains the least popular provincial leader in the country, though the picture is not as dire as it was earlier in the year. Wynne hit a low point of just 12 per cent approval in March, but appears to be climbing out of the depths. After confirming plans to raise the minimum wage to $14 at the beginning of 2018, and again to $15 in 2019, she sees a third consecutive quarterly rise, this time up 3 points to hold the approval of one-in-five Ontarians (20%). Wynne faces re-election in 2018. 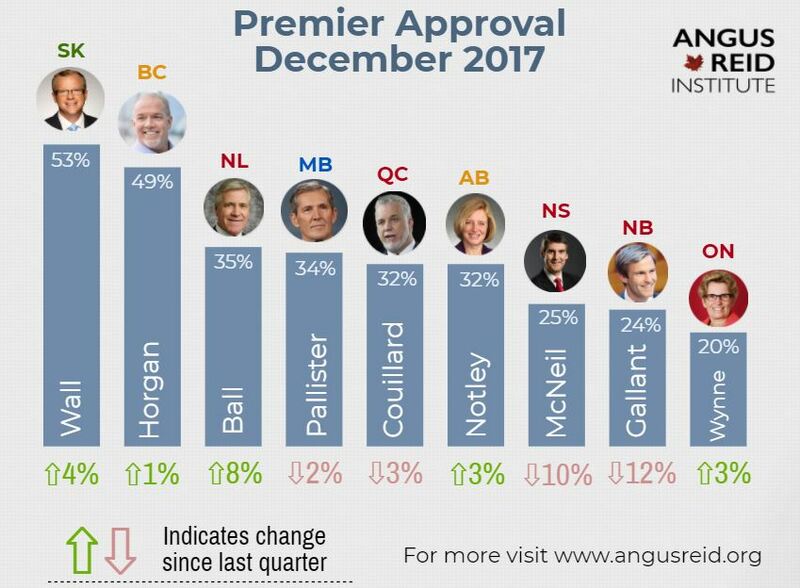 Newfoundland and Labrador Premier Dwight Ball has been among the lower ranks in premier approval since the second quarter of his term. This wave however, he makes the largest jump, up eight points to 35 per cent approval. Ball may be scoring points with residents after he announced his government will seek to increase transparency at provincial energy regulator Nalcor. The embattled energy corporation has been lambasted for its Muskrat Falls project, which has approached $13B in costs and been called “poorly planned” and “reckless” by Ball. The Liberal government has ordered an inquiry into the project, which was undertaken by the previous Conservative government. The biggest drop in approval this quarter belongs to Brian Gallant, who has sees his approval down 12 points since September. The New Brunswick leader may be facing blowback from the reportedly rushed implementation of a new property tax assessment and the role played by Gallant’s chief of staff Jordan O’Brien. Several thousand homeowners were hit with tax heavy tax bills after the new assessments and more than 18,000 challenged their tax bills after the changes. The government has also faced protests over decisions to privatize extramural management, a publicly funded service run by the Regional Health Authorities. Nova Scotia Premier Stephen McNeil, who was re-elected in May, is down 10 points this quarter. McNeil, just seven months into his mandate, may be lagging in public opinion after pressure from seven of the provinces public sector unions forced the government to send its controversial Bill 148 to the Court of Appeal for constitutional review. The government had introduced the bill to implement a wage pattern on public-sector employees. McNeil also sparred publicly with the province’s auditor general over comments about the doctor shortage in the maritime province, which the attorney general says has been exacerbated by poor communication between the Health Authority and Department of Health.